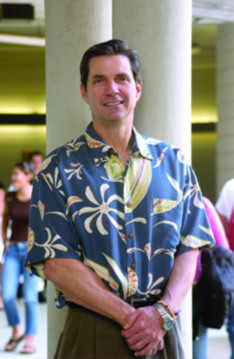 Professor Dana Alden of the UH Manoa College of Business. Social services and businesses can learn a lot from each other. University of Hawai'i at Manoa College of Business Professor Dana Alden calls the fusion "social marketing," and he adds international focus to the mix. It’s what links a seemingly disparate academic career—BA in environmental studies, MA in public affairs, MBA (’84 Manoa) in marketing and PhD in international business—and managerial positions with Planned Parenthood, Hawai'i Community Foundation and Straub Foundation. "People equate marketing to brands like Coke and advertising on the Super Bowl broadcast, but it’s really about customer management," Alden says. "It’s not about how to design a car, but what consumers are looking for in a car. You need to anticipate needs whether you’re talking about lifestyle, products or services." Marketing tools blend psychology and economic theory and apply them in the market place. Social marketing addresses pro social/pro healthful behaviors through a marketing approach, whether the goal is reducing teen smoking or increasing contraceptive use, he continues. "It’s an opportunity to take basic business principles that work very well and apply them to social concerns." Alden’s early work focused on cross-cultural behavior and how to adapt marketing principles to an international market. How much can you standardize your product or service, how you package and distribute it, how you communicate about it? When do brands become worldwide symbols and mix with local culture? Eventually, he brought these kinds of questions to bear on his longstanding interest in reproductive healthcare. "For years, quality was gauged by objective measures—did the counselor offer all the options, was the facility clean, what was the outcome? There was little data on client perception," he says. "In the 1990s, that began to change throughout the healthcare industry, but we were slow to do it internationally. The business models were less apparent." After several research projects in Thailand, Alden expanded his focus to Vietnam and other Southeast Asian countries. His paper on integrating business models with healthcare approaches to client satisfaction in family planning clinics in Hanoi, co-authored with Manoa’s Bhawuk Dharm and Do Mai Hoa, has been accepted for 2004 publication in the international journal Social Science and Medicine. Where needs are dire and resources limited, delivery systems tend to focus on facilities and products, he observes. "My philosophy is that it’s not enough to have brick-and-mortar facilities, you need to have client-centered care." Then you may discover that clients are unhappy when they believe others get preferential treatment at crowded clinics or that a paternalistic approach doesn’t always guarantee that patients will follow the doctor’s orders. Even within Asia, there appears to be cultural differences, Alden observes. His research in Thailand indicates that clinic loyalty is tied to a positive emotional experience. In the Philippines, clients are more concerned with the quality of service. In Vietnam, patients may put up with poor service because they have fewer options, but they may not follow the physician’s advice or return for additional care. What may be universal, Alden says, is that success rates improve in proportion to the quality time providers spend with clients. And that speaks to what the social agencies can teach business managers: ultimately, success depends as much on understanding client concerns as on achieving business efficiencies.